Category BS 6 miles / 1109 ft. Minimum age 16 years on race day. Entries £5 on the day. Registration is at the Peel Park Hotel, Turkey Street, Accrington, BB5 6EW. Registration closes at 11.45 am. Parental consent is required for runners aged under 18 years. Held under UKA rules and registered with the FRA. Runners must bring waterproof whole body cover to the race, in case it is needed. A decision will be made on the day on what must be carried during the race. Records: Men – R Hope 36.12 (2004). Ladies – L Powell-Smith 42.53 (2017). Results will first be published on ukresults.net. The results will subsequently be published on the FRA website, and also on the Clayton website. Results from previous years. Individual and team (of three) prizes. There is a prize for the first member of Clayton-le-Moors Harriers. The race is the first event in the Pendle and Burnley Grand Prix – a series of races through the summer months. Open to children under 17 years of age on 31st December 2019 and minimum age 6 years on race day. Distances comply with the Fell Runners’ Association Rules. Entry £2 on the day. Entry Form. Registration is at the Peel Park Hotel. Goody bag for all finishers. First race 10.30 am – U7 and U9 categories. Children aged at least 6 years on race day and under 9 years on 31st December 2019. Two laps of the school field – a maximum distance of 1 km. Route map. Second race (starts when the first race has finished) – U11 and U13 categories. Children aged at least 9 years and under 13 years on 31st December 2019. 2 km route on the paths below the coppice. Route map. Third race (starts when the second race has finished) – U15 and U17 categories. Children aged at least 13 years and under 17 years on 31st December 2019. 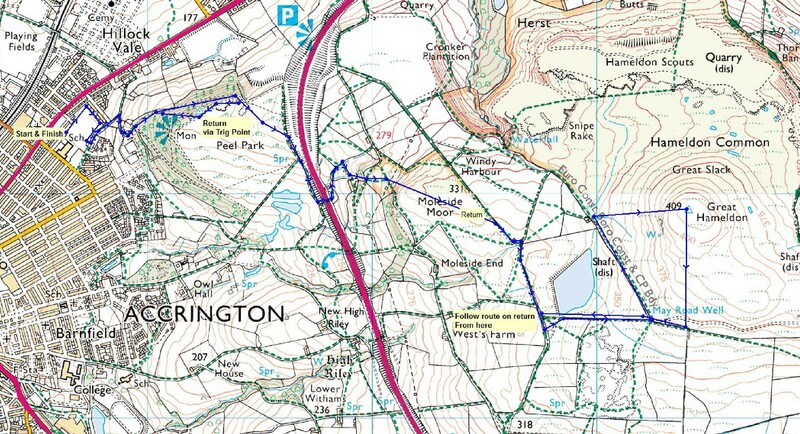 3 km route going above the coppice. Route map. The Great Hameldon Hill Race started in 1979. 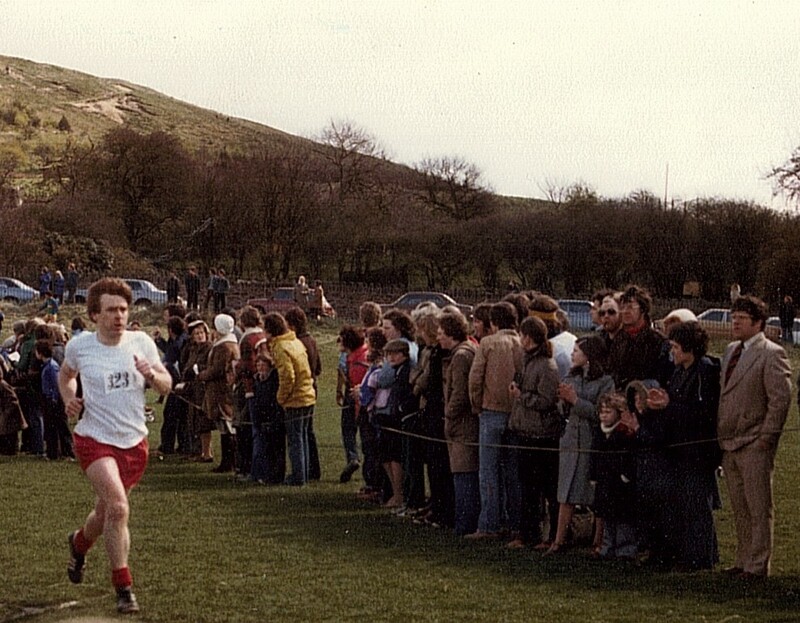 Organised by Clayton-le-Moors Harriers, the aim was to get local people to ‘have a go’ at running, following the running ‘boom’ which took off in the USA in the mid 70’s and was now having an effect here. By race day 371 people had entered and 308 turned up (a normal drop out rate is around 20 per cent). Around 90 local people (living or working in Hyndburn) ‘had a go’, many of which entered as ‘local’ teams. The largest local teams were Hyndburn Squash Club, Moorhead High School, Whinney Hill FC, Accrington Cricket Club, Oxo of Great Harwood, and Accrington Fire Brigade. Clayton-le-Moors Harriers had 69 finishers. The race started at the bottom of Avenue Parade as there was little problem with traffic in those days, and finished on Peel Park School field. 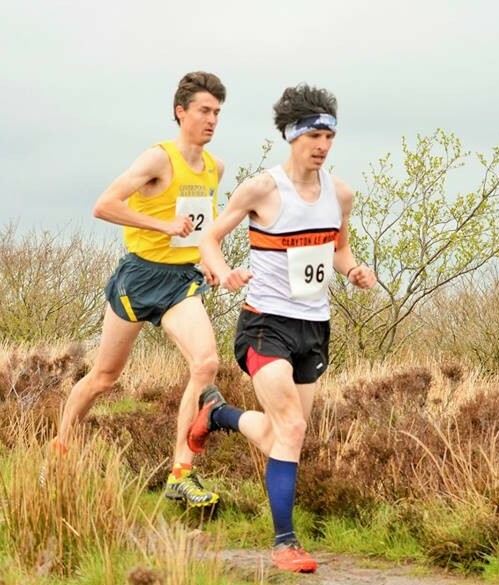 The winner was Ricky Wilde of Manchester, a renowned fell runner, in a time of 27 minutes 36 seconds. Our local champion Ron Hill had just turned 40 years of age a few months previously and was therefore classed as a veteran. Ron was eighth, despite fell running not being his first choice, in a time of 28 minutes 39 seconds, an amazing achievement in those days. Fell running was only just adapting to allowing women to compete, hence only 17 Ladies finished and led by Jean Lochead of Airedale in 34 minutes 41 seconds. This fell race was one of the first to allow Ladies to run in the same event as men. The first local, ‘have a go’, runner was Pete McWade, finishing in nineteenth position in 30 minutes 21 seconds. The organisers, Mick and Sue Raine and Bob Mitchell, reported that as Ricky Wilde crossed the finishing line there was the loudest cheer heard on that field since Accrington Stanley played there. The following year 388 people finished including 26 Ladies. The number of local ‘have a go’ teams increased to eleven and there were 49 children in the first junior race – 15 from local schools. Numbers continued to increase until 1991 when 491 seniors finished and 105 juniors. From there, interest in keeping fit and sports in schools started to decline. In 2013, 173 seniors completed the event including 32 Ladies. The good news was the juniors attracted 30 youngsters and a sign of improving interest in these age groups.